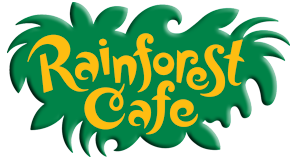 The Rainforest Cafe located in Niagara Falls Ontario Canada, opened in May 2001 and offers a diverse menu that will please all members of your family or group. The combination of great food and a one of a kind décor featuring animatronic animals, indoor thunderstorm, sounds of the jungle and more all add to this unique dining experience. Located on the Falls Avenue Entertainment Complex the Rainforest Cafe keeps you connected to the best that Niagara Falls has to offer including: 4-Diamond fallsview accommodations, the 3 acre Fallsview Indoor Waterpark, the only Hershey Store of its kind and Casino Niagara! Other dining options are also available including Hard Rock Cafe, Perkins, Fallsview Restaurant and the Fallsview Rainbow Room Restaurant. All of this is available to guests with the added bonus of being directly across from the Falls. The Rainforest Cafe Niagara Falls location is operated by Canadian Niagara Hotels; the Rainforest Cafe chain is owned by Landry’s Restaurants Inc. and is one of the largest casual dining and entertainment companies.